Evan S. Connell's Mrs. Bridge (and her novel husband Mr. Bridge) form a modest but quietly profound portaiture of mid-20th century middle America that is likely to resonate in our literary canon for a good long while. 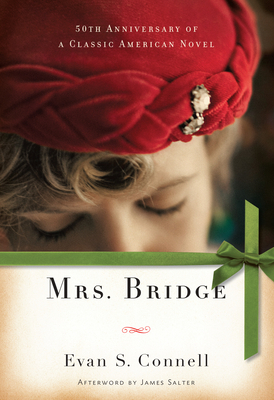 In Mrs. Bridge, Evan S. Connell, a consummate storyteller, artfully crafts a portrait using the finest of details in everyday events and confrontations. The novel is comprised of vignettes, images, fragments of conversations, events--all building powerfully toward the completed group portrait of a family, closely knit on the surface but deeply divided by loneliness, boredom, misunderstandings, isolation, sexual longing, and terminal isolation. In this special fiftieth anniversary edition, we are reminded once again why Mrs. Bridge has been hailed by readers and critics alike as one of the greatest novels in American literature.